Thanks to NetGalley, Bookbridgr and Headline for the ARC of this book. ‘Hello, Goodbye and Everything in Between’ follows high school sweethearts Aidan and Clare on their last night before leaving to go to university on opposite coasts of America. They revisit places which have been significant to their relationship as they try to come to a decision about whether to stay together or split up. I really enjoyed this as a concept for a book. It’s a dilemma which thousands of kids have to go through every year but about which I don’t recall reading before. I did find that for two teenagers the characters had a little more prescience than I would expect. They understood how unlikely they would be to make it as a couple and the damage they could do to their relationship and their college experience by trying to stay together. I’m not sure teenagers are that thoughtful, I remember starting uni and there were loads of girls who arrived with boyfriends at home and within the first month only one of these couples were still together. However, I do think the book captures the pain and confusion of this situation perfectly. The staying up all night talking things through is exactly what happens in these situations. I went through something similar with my then boyfriend now husband before leaving to study in America for a year in 1999 and this brought all those memories back. Overall, I found this a sweet, enjoyable read which benefited from a simple concept and sparse narration. I’ve been a bit quiet on the review front recently. I had some momentous news a month ago and I’ve barely read anything since. I’ve wanted to but I’ve just found it really hard to concentrate on reading. Determined to get over this reading slump, I decided to pick up a really easy, short YA book which would get me back in the swing. 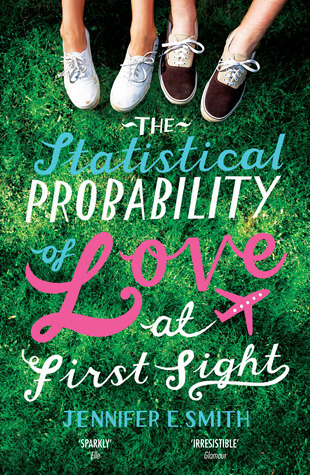 I chose ‘The Statistical Probability of Love at First Sight’ by Jennifer E Smith, which I had received as an ARC copy from Headline via Bookbridgr. I could tell from the title that it was going to be just the right type of light fluffy read I was looking for. The book is about Hadley, a teenage girl who is travelling to London to attend her father’s second marriage to a woman who she has never met. On the flight she meets hunky English boy, Oliver, and as you’d expect they hit it off pretty well. This is a very predictable YA love story, but it is enjoyable in it’s predictability. It’s incredibly easy to read and has a touching, satisfying ending. It’s forgettable but very sweet and likeable. I wasn’t entirely convinced by the details in the description of the flight, it felt like it could have been better researched. For example, on trans-Atlantic flights everyone gets their own TV screen and you don’t have to pay for alcohol. However, this is my only criticism; the book generally does exactly what it sets out to, it made me cry and it made me smile.